I think some of the tunes are even more "memorable". The clock offers 40 tunes - I recorded 10 of them before survival instincts kicked in. There are some plumbers in Canberra, named Greaney & Sweaney. On the back of their truck is written: "the pipes, the pipes are calling". Heh heh, I was musing last night. Isn't it lucky I listened to (and recorded) the difference between the internal clappers and the external strikers before I heard the programmed "performance". If the sound you hear recorded on the Danny Boy clip was all I had had to go on, I might have been considerably less enthusiastic in my response to the Bathurst Council! I was up in Canberra on the weekend to do some stuff with the carillonists on matters relating to carillon mechanics, maintenance etc. I made up a manual clapper by turning the outside of an old counterweight into a curve. I then sanded a flat on one side. I found I could demonstrate the difference in sound between a flattened clapper and a well-rounded one, but striking wasn't always reliable. With a hand held clapper, you can't guarantee to hit the bell with the flattened section at right angles. If you turn it just a bit, the edge of the flattened circle hits first, and then it sounds OK again. Quite different to the hinged clapper, which always lands flat first. Striking different areas of the bell did produce very clear differences. And striking the bell with a much underweight hammer also produced clearly different (and less pleasant) results. The point I wanted to make is that bells and clappers go together like fiddles and bows - the best fiddle will not play anywhere near its best with an inappropriate bow. I also played them the comparison between the two clappers at Bathurst, and we did a little experiment. We wrote down the names of the notes in the partials and played them on the piano in the clavier room. We assigned two players. The Good Guy played the harmonious partials that are always there: D5, D6, F6, D7, A7. Nice. Then the Bad Guy added the additional partials only heard with the external striker: G7, C#8, D#8, E8 and G8. Not so nice. It's not fully representative as further analysis also reveals that those notes are not accurately pitched, and that there are actually two D#8s and two G8s. But certainly enough to curdle the blood. Now the Londonderry Air story. In the 1948 congress of the GCNA, at Luray Caverns, Luray, Virginia, Percival Price gave a presentation on arranging folk songs for the carillon. Percival was a brilliant man, and he had many excellent ideas, but he was also a domineering personality, and didn't hesitate to assert his authority. He announced that there were three melodies that should "never, under any circumstances" be played on bells. They were Londonderry Air, Annie Laurie, and unfortunately nobody seems to remember the third one, but presumably another song that has some climactic melody note much higher than the others. 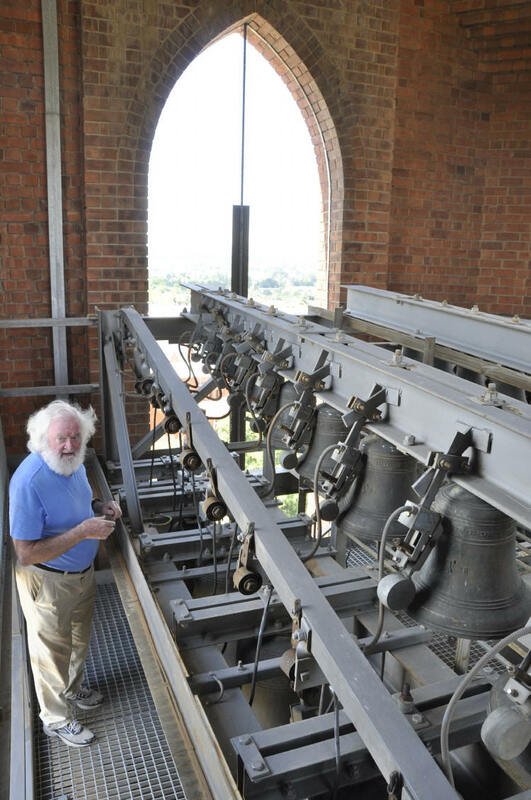 Well, immediately following this lecture, Charles Chapman, the host carillonneur at Luray, went up in the tower and proceeded to play all three, and did so quite convincingly! Now in fairness, though Luray is a four-octave instrument (47 bells, 1937 Taylor carillon, pitched down in A), Charlie mostly played very simple harmonizations using only the bottom two octaves. If you're playing a melody like that in the bass, you have a good bit of range before you get into bells that won't carry that climactic point. On a Paccard, Fritsen, or Eijsbouts these days, all that is probably a non-issue, but Price had a point if you were playing the melody up into the third octave on the carillons that were available at the time. Still, it's a great story! Reminds me of playing and even singing in a local version of "Bunratty Castle" in Canberra in my younger days. The simple advice from the "Musical Director" (a larger-than-life Irish tenor never known to be sober) was that at the end of each song, you "slow down, and go up". That's called "an arrangement". Now, anyone happen to know who made these external strikers? I imagine it's either Paccard or Clock-o-Matic, as the latter is the manufacturer of the controller, and the chap who installed them is the Australian agent for the former. But it's also possible that they are from a third-party supplier. I don't remember seeing any names on them. Last edited by TerryMcGee on Mon Mar 25, 2013 7:00 am, edited 1 time in total. I don't know for sure, but the striker action resembles Clock-O-Matic, all right. (The striker actions, though not the strikers, at Ball State are Clock-O-Matic.) They supply strikers for many other companies, including Taylor and Verdin (the latter being a US company that handles Petit & Fritsen bells). OK, I did the recording tonight, choosing one bell, playing forte in all cases, "staccato" touch and "legato" touch. Three sets of those. One with the clapper having some wear (not a lot - I turn the clappers every year), one with a fresh strike spot, and one with the clapper ball raised from its initial position (11 5/16 of an inch from the inside of the bell head to 10 9/16 - that's as high as it would go. The note is f#2 (keyed to g2). I can record more if you need, but I do think there will be some revealing results. The bell has two roller-bars, by the way, along with a return spring. I have e-mailed the sound files to Terry. Hey, I want to hear them too! Could you please put them up here or e-mail them to me? You know I am digging into how much difference in sounds by articulations we can actually get out of a carillon! If Terry doesn't post them, I will. Frances, I think in terms of listening it is much easier to hear the difference in a passage than it is on a single note. For that, my video, "First Lesson at the Carillon" is a good resource.